This is caused by the Intel Quiet boot setting on the server board BIOS. This causes the Intel splash screen to be displayed; all RAID and system error messages are hidden behind it. This means that any RAID card prompts (i.e. something that requires a key-press or some action) causes the system to appear to hang, as you never see the instructions. The system will not enter the BIOS until the RAID card BIOS completes. This can happen either after motherboard or RAID card replacement, or on a system that has been running fine but has experienced a RAID event (such as a failed volume, card fault or RAID battery issue) causing the RAID card to start to need corrective action during the boot process. In this situation you may find that waiting for the BIOS setup to appear may happen after a considerable wait - for example, after the RAID card times out - but often this is not the case. 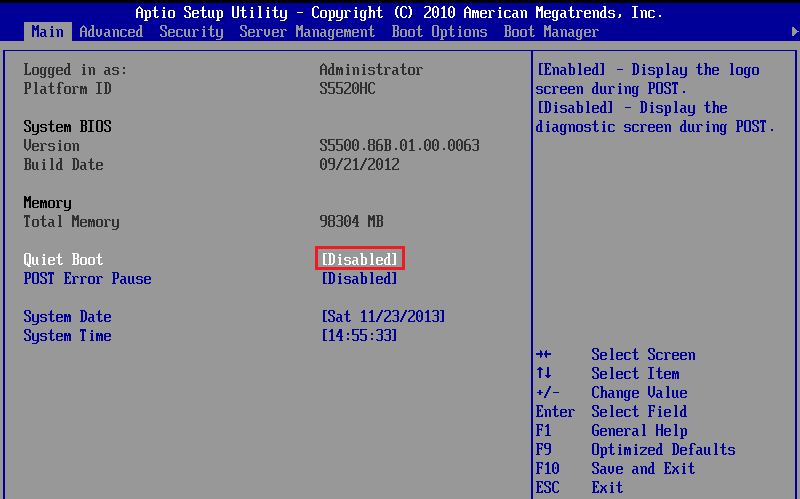 You need to disable Quiet boot in the BIOS but in order to gain access to the BIOS you will need to remove the RAID card from the system. This will enable you to see all of the POST messages and see the RAID BIOS start. Remove the RAID card from the system. This should only be performed by an experienced technician. You may be able to remove the card but leave the drive and other signal cables connected. If you do so, place the card on an ESD safe non-conductive surface. Remember that cards with cache batteries fitted will be partially powered even when the system is turned off. Tap the F2 key during the server post process to go into the main BIOS setup. Usually you should start tapping the F2 from the time you hear the first POST beep until you see a message confirming that the system will enter setup. Ensure that in the Main menu, Quiet Boot is set to Disabled. Remember: When performing a RAID card replacement, or motherboard replacement, always ensure that you disable quiet boot before fitting the RAID card. Also remember that any replacement RAID card may also benefit from a firmware update - this needs to be applied before the drive cables are connected and the foreign volumes imported.